2. DQ date night. A sweet treat and conversation with my lovey. Ice cream seemed PERFECT for the first day of Spring, yet I needed to keep my heated seat on high the entire time I enjoyed those long red spoonfuls of Cappuccino Heath yumminess. ... The weather has gotta warm up eventually, right?! 5. FORGIVEN F O R E V E R. I haven't stopped singing this since Sunday. LOVE. So awesome that you're going to Disney!!! A girls' craft night sounds pretty great. Do you get together once a month? I need to try something like that! I love craft day how fun. And of course loving your minnie :). I love that song and his voice! Ahh! I love Blizzards! How fun for a date night! I was so sad that we don't have DQ here, but we are getting one soon! Can't wait! Also, I'm a new follower and I nominated you for the Liebster award! Just a fun way to honor other bloggers. This is a lovely post! Thank you for sharing your favourite things, especially that wonderful song! I'd never heard it before so I really enjoyed listening to it. I actually share a song on my blog each week at my Tuesday Tune post. Please pop by if you have a moment! I'm also hosting my weekly linky party right now as well! It's called Say G'day Saturday and you can link up anything and everything! DQ, yum! I used to work there in high school, so I can make a pretty sweet cone!! Whenever there's a soft serve machine, I always test my skills to see if I still got it! ;) Super cute Minnie rosettes!! Gotta love craft days with the girls! Hope you had a fabulous weekend!! Thanks for linking up with me! 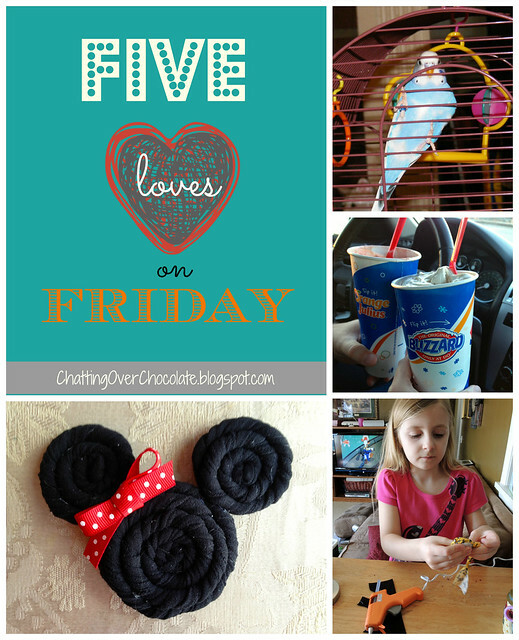 If you have time, I'd love it if you'd link up at Family Fun Friday - it can be an older post - just choose you best family friendly and fun ideas. You get entered to win FREE jewelry.